Waugh saw WWII coming the same way Kafka saw the Holocaust coming, Fitzgerald saw the Crash coming, Tolstoy saw the Russian Revolution coming, and Chaucer and Dante saw the Reformation coming. A good writer, being a careful observer, is going to be good at observing the direction things are headed in. Both “24” and “Alias” were shows debuting that September about US antiterrorism squads facing off stateless terror organizations, and they both had to edit their pilots after the attacks. 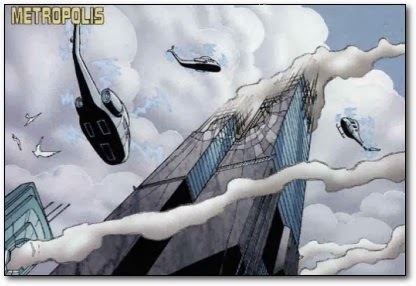 In comics, “X-Men”, “Superman” and “The Dark Knight Rises” all had storylines published that month in which planes crashed into skyscrapers to launch apocalyptic attacks. And of course, this album was released a few days before the attacks. Tapping into real life national pain doesn’t just mean saying “Hey, remember that thing that just happened, I’m going to give it a shout-out”. It also refers to giving voice to the fears, doubts, anger, and violence lurking under the surface of our modern life, and considering what dangers might be about to erupt. Do you think this applies to comedies as well or only to the darker, more serious narratives? I disagree a bit. I think that different genres have different strengths as they look forward. It's perfectly natural that thriller writers are prescient about the new next way we all could die. Comedies strike me as better anticipating/reflecting exactly the sorts of broader everyday social and societal trends that are the bread and butter of their tension-relieving laughs. For me, though, the deeper undercurrents of history require a more incisive literary imagination (whether it's employed filmmakers or writers). I'm thinking particularly of the way that a documentary film like GIMMIE SHELTER anticipated the end of the 60s hippie culture alongside a piece of longform journalism like Joan Didion's "Slouching Towards Bethlehem." I think you're giving the creators of 24 and ALIAS a bit too much credit comparing them to somebody who was a true visionary in his field like Clancy (at least when he wrote his own novels). There's a huge obvious reason for the timeless appeal of non-state actors as bad guys in film & TV spy fiction: not only do you not risk being eclipsed by unpredictable historical events (like the fall of the Berlin Wall, for instance or the collapse of the Soviet Union), but you don't alienate ANY of your potential overseas markets now or in the future. Just look at the huge mess the producers of the (in any case and in all ways still atrocious) remake of RED DAWN got themselves into by picking China as a plausible invading army. The film was already in the can when somebody at the studio realized that China was now the number two film market in the world. And they wouldn't look kindly upon the entire slate of a studio who had so villainized their nation, even if the film itself was never going to play there. It literally took years to try and undo the mess with CGI switches to North Korean branding that still left numerous background images of flags, banners and logos on military equipment untouched (because the jingoistic target market is so uninformed they'll never notice!). Casting generic non-state actors as antagonists isn't so much the seer's choice as the safest choice. I feel that way about the hunt scene in RULES OF THE GAME. It's like a commentary on all the violence in Europe which is about to happen, especially set in the middle of a film about European society coming apart. It's one of the things that pushes that film over the top into masterpiece territory for me. The pilot for The Lone Gunmen (the X-files spin off) famously had a plan to fly planes into the world trade center 6 months before 9/11. It never got broadcast in the UK because of that.